The incident occurred around 5.30 a.m. on a regular local service to the Wadala station. There were no casualties in the incident. Exact cause of the fire is being probed although officials suspect a short-circuit might have caused it. 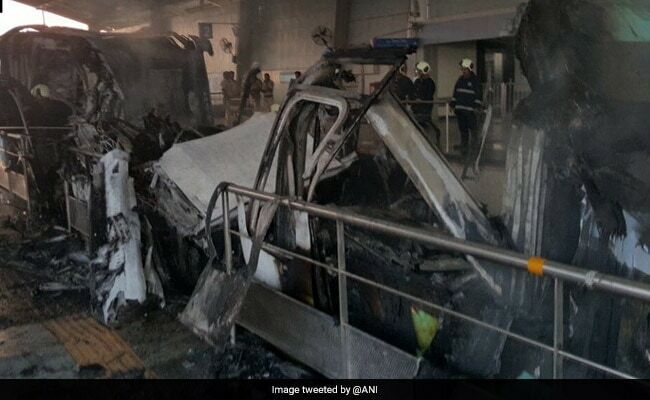 Mumbai: Mumbai Monorail services were stopped for hours this morning after two coaches caught fire in the early hours of Thursday morning. No injuries or casualties have been reported as there were no passengers at that time. Images showed one of the coaches completely destroyed in the fire. Reports suggest around 5.30 am, the fire started on a regular local service to the Wadala station. Officials suspect a short-circuit might have caused it. Earlier this year, two trains in opposite directions nearly collided after ending up on the same track near Chembur. The trains were stopped before a disaster could take place.